Photo courtesy of John Emin Jr.
Like the ripples caused by a pebble tossed into a still pond, sometimes a minor event can have far reaching effects. Take for example a boy in Pennsylvania who yearned to be a pilot; or the young man in Rhode Island with a passion for flying who decided to build an airport. The decision made by each would touch the life of the other, and ultimately play a role in the outcome of the Second World War. This story is true, but it’s virtually unknown beyond the borders of Smithfield, Rhode Island, and therefore won’t be found in any history books about the war. It might never have come to light had it not been for cards and letters saved by John and Marjorie Emin; owners of a farm once located where Bryant University stands today. John was a pilot, and like most pilots, he wanted to own an airplane. 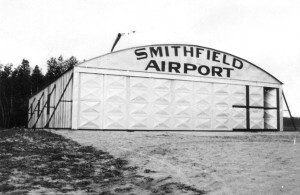 In July of 1931 he purchased a two-seater Curtis Pusher aircraft which he kept at What Cheer Airport in Pawtucket about twelve miles from his farm. Twelve miles may not seem like much of a distance today, but automobiles and roads in those days made getting from Smithfield to Pawtucket a bit of an effort. Therefore, John fancied the idea of an airport closer to home. In December of 1932, William G. Benn of Coudersport, Pennsylvania, was a 2nd Lieutenant with the103rd Observation Squadron of the Pennsylvania National Guard. Three days before Christmas that year he and his observer, Private John G. Mallon, left Boston for Philadelphia in a Douglas O-38, bi-plane. The weather of course was cold, as is typical for New England in December. Snow flurries were already falling as the plane lifted into an overcast sky, and within an hour the flurries turned to snow. As winter winds buffeted the plane, ice began forming on the wings causing a loss in airspeed and altitude. Before long, Benn was struggling to keep his ship in the air. The men knew they were in trouble, but finding a place to set down presented a problem, for the plane lacked a radio and they were over unfamiliar countryside. Checking a Department of Commerce map, Mallon discovered that the nearest airport was already several miles behind them in Woonsocket, Rhode Island. (The Woonsocket Airport no longer exists.) By this time the plane was barely one-hundred feet in the air and in danger of stalling for lack of airspeed. With no other choice, Benn took a heading for Woonsocket, when suddenly below them appeared a small airport that wasn’t on their map for it had only opened a few weeks earlier. Thanking God for their deliverance, Benn set the plane down on the snowy field and coasted to a stop. 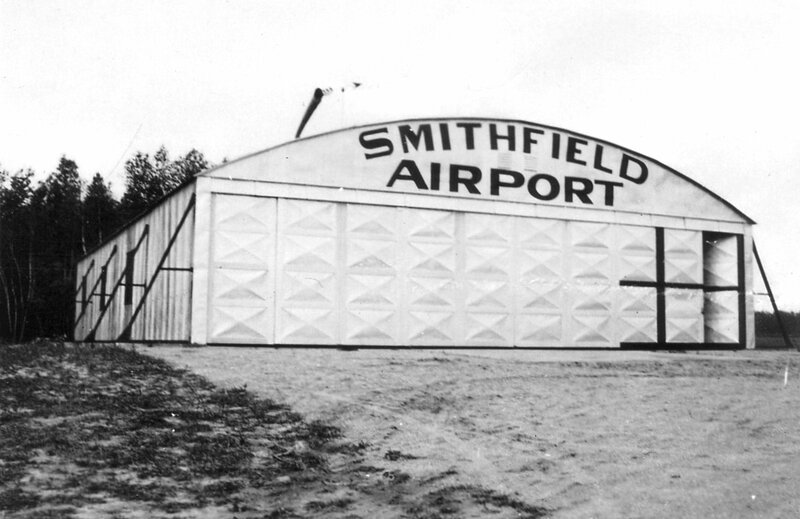 The name on the hangar told him they had landed at the “Smithfield Airport”, but neither of the airmen had any idea where Smithfield was. As Benn and Mallon climbed from their airplane they were met by John Emin who had seen their emergency landing from his farmhouse. (The farmhouse stood where the dome of Bryant’s “Unistructure” is located today.) After brief introductions, Benn asked to use a telephone to notify his superiors that he had landed safely and hadn’t crashed in the storm, but John explained that he didn’t have one. The nearest phone was at a general store about a mile down the road in the village of Stillwater, and John graciously allowed the airmen the use of his car to get to it. In March of 1935, Benn published his recollections of this day in an article he wrote for the Pennsylvania Guardsman, in which he described the store in Stillwater as “the original country store”, with a pot-bellied stove in the center and shelves lined with tobacco, groceries, shoes, clothing, toys, and “notions”. Benn described how he and Mallon ate bananas while waiting for their call to be put through, and noted the attention they were getting from several card-playing locals who stopped their game long enough to give them a thorough once-over while a dog stood at their feet begging for a handout. When their business was complete, they returned to the airport where John and Marjorie invited them to stay until the weather cleared. The flyers graciously accepted, but having lived in a large city like Philadelphia, they were surprised to learn that country living meant doing without certain “luxuries” such as indoor plumbing and electric lights. In his article Benn recalled how they spent an enjoyable evening with their hosts and slept soundly in an antique featherbed. The following day the weather in Rhode Island had cleared enough where they decided to try for home. The young men didn’t forget the kindness shown to them and wrote thank you notes. These letters and other correspondence have survived, and are still in the possession of the Emin family. May this note of appreciation find you snugly returned from a very Merry Christmas in New Bedford. The trip down to Philadelphia was none too pleasant. The snow lasted down to New Haven with haze and mist from there into this city. Landed here at 2 in the afternoon so it did not take very long. Found that all of this area was closed in with clouds and rain Saturday so am all the more glad that we were honored by your hospitality. Would like to have put on a little more show for you but trust that you will believe me when I say that it takes but a small amount of ice formation on a wingfoil to change the flying characteristics of the airplane. She flew right wing heavy all the way down to Trenton where the warm air into which we were flying, melted most of the ice away. Might call to your attention the fact that upon landing, we asked if they had any trouble in finding Smithfield. The answer was no because they had a late edition of the Department of Commerce map of that area and that it was well marked. I trust that you will not be swamped with transient pilots who, after hearing of our wonderful experience with you, would like to duplicate. We both wish to assure you that we had a most enjoyable time and were truthfully reluctant to depart. We thank you sincerely and hope that we may have the good fortune to call upon you again. What followed was a pen-pal relationship between the Emin’s and William Benn that lasted into World War II. Benn sent the Emin’s a copy of the Pennsylvania Guardsman magazine containing the story of his unexpected visit, along with a letter describing how his mother liked the informal account he had sent to her, rather than the formal version that appeared in print. To this Benn wrote: “But after all, I do not pretend to be any sort of writer – to the contrary, just a good pilot, and to that end, my story is going to remain. However, I did so hope that some others would have the pleasure of enjoying our trip with us. I believe that many of the boys have and therein, the purpose fulfilled. Benn had taken courses in archeology hoping for a career in that field of science, but by the late 1930s it seemed apparent that the United States would be drawn into war so he elected to stay in the military. All the while he kept up his correspondence with the Emin’s through cards and letters. In March of 1941 Benn wrote that he and his wife Dorothy were the proud parents of a daughter, Bonnie. The following Christmas the United States was at war. The Emin’s mailed Benn a Christmas card that season of 1941, but he waited nearly four months to respond. It’s understandable due to what was going on at the time for all military personnel. At the time Benn wrote that letter he was assigned to the U.S. 4th Air Force, commanded by General George Kenney, based in San Francisco, California. Kenney had been in the army since World War I, and was held in high regard for his innovative ideas in the use of aircraft serving in combat roles. In the spring of 1942 he took command of the 5th Air Force which was ordered to Australia to fight the Japanese. He brought with him fifty hand-picked pilots who had served under him in the 4th Air Force, one of them being William Benn, who was assigned as the General’s aide. Part of the mission of the 5th Air Force was to support allied ground troops and attack Japanese supply ships re-enforcing enemy positions. The initial strategy had been to use high altitude bombers to bomb enemy ships, but bombing from high altitudes allowed targets ample time to scatter and avoid being hit. The obvious answer was to conduct the bombing at lower altitudes, but this carried higher risks for the aircrews, and early in the war the United States didn’t have the airplanes to spare. William Benn, who by this time had been promoted to Major, pondered the problem and came up with the idea to attack the enemy ships from the side rather than from above. In August of 1942, he went to General Kenney with an idea he called “skip bombing”. Benn proposed using conventional bombs which could be “skipped” across the water like a stone across a pond into the side of a ship. The bombs would be equipped with delayed fuses to give them a few seconds to sink below the hull waterline before exploding, thereby producing maximum damage. The plan of attack was to send in two groups of high-level bombers as a diversion to attract enemy anti-aircraft fire, while a third group would come in low, about 300 feet above the water’s surface, and release their bombs. One obstacle to overcome was the fact that conventional bombsights were designed for dropping bombs from high altitudes, not low-level attack runs. Benn solved this problem by making cross hairs out of electrical tape on the Plexiglass nose of the aircraft where the bombardier sat, thus using the plane itself to aim the bomb. By the autumn of 1942, Benn’s squadron was ready to try his skip bombing technique in actual combat. On October 22nd, Benn led a night mission against Japanese ships at Rabual with limited success. Although some vessels were hit, none were actually sunk. A second raid was conducted on October 30th with similar results. Even though initial success was limited, Major Benn had proven the idea had merit and set the course for others to follow. Major Paul Gunn later expanded on Benn’s idea by using modified B-25s equipped with forward firing guns with good results. Prior to the implementation of skip bombing, the allied success rate for bombing enemy shipping in the Pacific was less than five percent, but with skip bombing the success rate rose to over seventy percent. This no doubt changed the course of battles, saved American lives, and helped shorten the war. For his efforts Major Benn was awarded the Distinguished Service Cross, an award second only to the Medal of Honor. Benn’s success attracted the attention of Time Magazine, which featured him in an article about skip bombing that appeared in the January 18, 1943 issue. The article mentioned that Benn’s skip bombing technique was now the standard mode of attack used by General Kenney’s 5th Air Force. Unfortunately, Benn never saw the article, for on the day the magazine hit the newsstands, he took off from Jackson’s Drome airstrip on what was to be a routine reconnaissance mission and disappeared. The aircraft he was piloting was a B-25 Mitchell bomber with tail number 41-12485. There were six others aboard the lone aircraft when it vanished; Major Donn Young, Lt. Col. Dan Searcy, Sgt. Wilfred Coyer, Sgt. Herman Elsner, Cpl. LaVerne Van Dyke, and S/Sgt. Michael Ewas. No distress calls were ever received, and it was surmised that whatever happened had been sudden and quick. 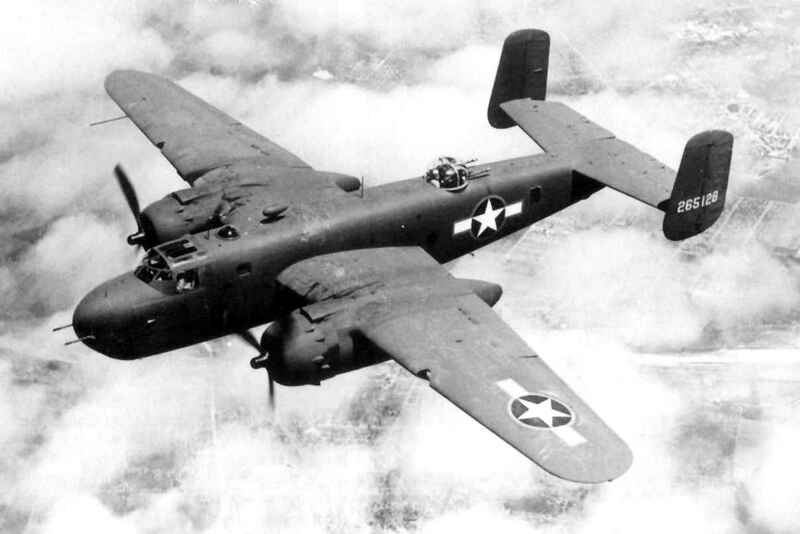 Search planes flew along the missing B-25’s estimated route, but found nothing. Speculation as to what happened was brief. There was a war on, and planes and men were lost everyday. Back in Smithfield, John and Marjorie Emin wondered why their friend Bill had stopped writing, and hoped it was because he was too busy. Then the day came when a newspaper clipping arrived in the mail stating that Benn was missing. Naturally they prayed for the best, but they never learned anything more. On March 2, 1943, what became known as the Battle of the Bismarck Sea began in the Pacific. The Japanese had sent sixteen warships to reinforce their troops in New Guinea, and the 5th Air Force was charged with stopping them. The battle raged for two days, during which the Allies used Benn’s skip bombing technique against enemy ships. When it was over the Japanese were the clear losers, and as a result, this was the last time they attempted to use large vessels to reinforce their positions. Even though he wasn’t there to see it, Major Benn’s skip bombing technique was credited for the American victory. World War II ended in August of 1945, and the troops went home to resume their lives. Those who had been lost faded into the recesses of history, remembered primarily by those they left behind. John and Marjorie Emin passed away without ever learning the fate of William Benn. Benn’s aircraft was just one of thousands declared “missing” during the war, however the mystery of what happened to him was solved in 1957 when an Australian survey team happened upon the wreckage of a World War II aircraft in a wooded valley in New Guinea. The tail numbers matched those of Major Benn’s long lost B-25. U.S. authorities were notified, and the remains of the servicemen were recovered. Investigators determined that the aircraft had not gone down due to hostile action, but had most likely entered fog when it flew into the valley, and the crew never saw the mountain looming ahead. Death had been instantaneous. One has to wonder if history would be different if John Emin hadn’t built his airport. Would Bill Benn have made it to Woonsocket? If he hadn’t survived, would someone else have developed the skip bombing technique? The world will never know, but it can be argued that because Bill Benn found safe haven that long ago Christmas many allied troops survived the war and were able to go home to live out the rest of their lives in peace.